Flowers sits grandly on top of the coastal ridges that border the Sonoma coast. The balance between the extreme height, maritime weather and a constantly shifting geography means there is nothing stationary about this producer! Flowers’ initial plantings in 1991 were some of the original plantings in this extreme location. Only two miles (3.22km,) away from the Pacific Ocean and varying in elevation from 350m to 571.5m, this is a unique slice of coast. This is particularly relevant to Sea View Ridge and Camp Meeting Ridge. All of these sites originated as sea floor was pushed up with seismic activity. The original marine sedimentary rock was transformed into schist, shale, sandstone, greywacke and greenstone through the addition of heat and pressure. 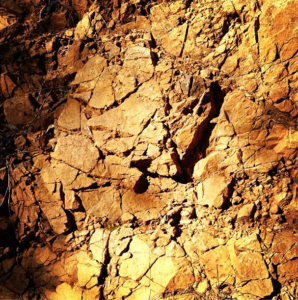 These ancient rocks and the weathered coastal soil play a huge part in building the flavour of the wines, limiting the vigour of the vine and in producing bright fruit notes with very distinctive minerality. Schist, shale, sandstone, graywacke and greenstone are found in the soils throughout Flower’s vineyards. The other benefit of these coastal sites is the sea fog and maritime breeze. These dual cooling elements really come into play when dealing with the summer heat California is famous for. This cooling effect means that the grapes have a longer ripening period. The hallmark of this is the fully ripened fruit bringing lively acidity and fresh, complex palate notes. These extreme elements really work together to produce wine that sings of it’s location. Perched in amongst these coastal pine covered ranges, both Pinot Noir and Chardonnay are present. The boney, mineral laden soil and these crisp climatic conditions lead to low, concentrated yields. Both varieties are rendered with aromatics and the kiss of the coastal environment. 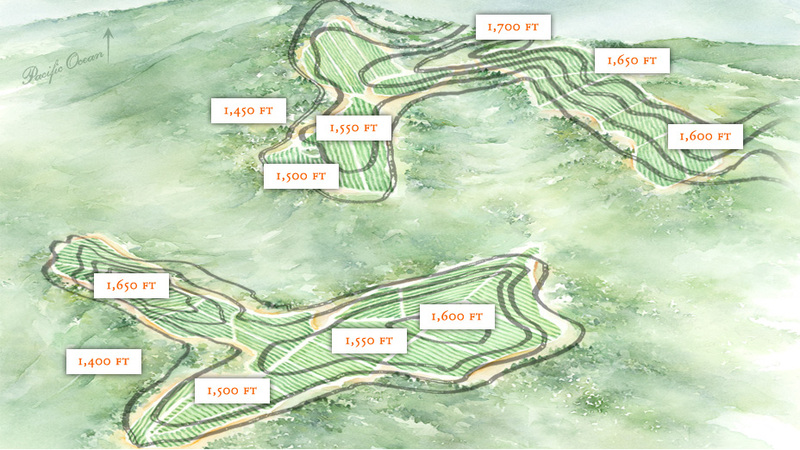 Map of the Flower’s Vineyards; Camp Ridge to the Bottom and Sea View Ridge to the top.